OEV is a program designed to educate all levels of riders, from beginner to advanced. 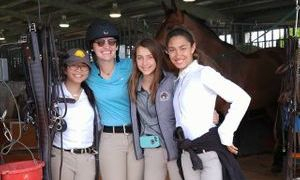 We teach a complete program from horsemanship to riding to showing in a positive and encouraging way to help the rider develop both mental confidence as well as physical ability. 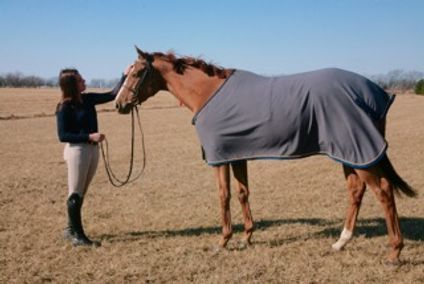 OEV will work to develop a personalized program within your budget to help a rider achieve their goals, whether it be learning to be comfortable around horses, learning how to check a diagonal or lead, showing on a local level or national level, to Intercollegiate, NCAA or US International Student riding, to the Grand Prix or major Equitation level. Come try us out and enjoy the experience of learning to ride! Owner/Rider/Trainer Brittany Harpool started riding when she was 13 years old in the Kansas City Area. Since this time she has competed from the local Sunshine Series circuit up to the Grand Prix Ring and Internationally. 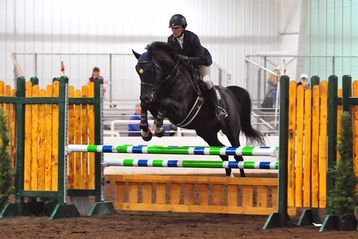 During her time at Virginia Intermont College Brittany competed on her mount Harry T. Stone in the Amateur/Owner Jumpers and in the Grand Prix arena. She continued to ride throughout her college career on the "A" Circuit as well as on the Intercollegiate Horse Show Association Team, the Interscholastic Dressage Team, and the International Student Riding Team. She competed in France, Italy, Germany, Sweden, Belgium and World Finals in Great Britain finishing 6th overall. She also spent time in New Zealand riding with Olympic Medalist Greg Best. After graduating with a Bachelor of Science - Business Administration-Management degree and a Minor in Equine Studies, Brittany moved to St. Louis and worked at Griffin Farms to learn more about the horse business. From there she took a job with the well known Wilhelm Genn to learn more about the training of young Grand Prix horses. Spending a year traveling and working with horses such as Happy Z and Chantal, Brittany learned the keys to flatting horses properly, feed management, proper shoeing, and proper horse and rider fitness as well as many other aspects of horsemanship and how to move/manage a successful show barn on the road. After this experience she began working with Joey Brumbaugh out of Tulsa, Oklahoma. Traveling with his very successful barn cliental he allowed her numerous hours at the ring to learn effective coaching, how to work with top hunters, how to work well with different types of clients and how to prepare horses for each client's specific needs. Moving back to Overland Park, she took a job as rider and trainer for Kirin Farm in Kansas City. After a year of spending numerous hours in the ring the time had come to put years of knowledge and experience into starting her own business in her home town of Overland Park, Kansas. Brittany is dedicated to building a strong program in Kansas City that focuses on the development of horsemanship skills as well as competitive hunter/jumper athletes both human and equine.